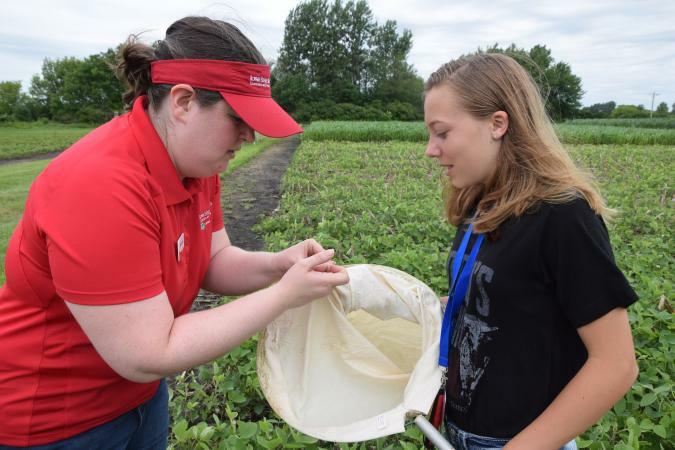 Students who participated were able to travel to the Iowa State University Field Extension Education Laboratory (FEEL) to solve “the mystery of the disappearing yield.” The objective of the program was to help high school students establish a base knowledge in agronomy, horticulture, entomology and plant pathology. Students were then tasked with identifying and implementing management practices that both improved yield and productivity. According to a post workshop survey done by the members who participated, students reported moderate to major increases in knowledge in identification and management of insects, diseases and weeds. In addition, a majority agreed that having in-field experience at FEEL was extremely valuable and vital to accomplishing their learning objective on the last day of the workshop. This response indicates the importance of the FEEL facility, and the important role it plays in educating the next generation of farmers, agronomists and agribusiness professionals. On a larger scale, a similar conclusion can be drawn; using the environment as a classroom offers much greater and enhanced learning opportunities that cannot be found in traditional classrooms. Students reported that they loved learning new things. They learned not only the correct identification of pest insects, diseases and weeds, but also how to manage these issues and solve problems. If anything could be changed, students wanted to spend even more time in the plots out at FEEL. All of the students surveyed plan to attend college, with more than half of the students entering into post-secondary education within the next two years. Many will be entering into an agricultural major.